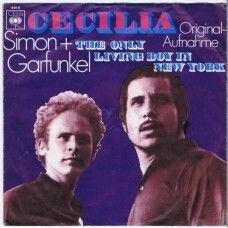 "Cecilia" is a song by American music duo Simon & Garfunkel, released in April 1970 as the third single from the group's fifth studio album,Bridge over Troubled Water (1970). Written by Paul Simon, the song's origins lie in a late-night party, in which the duo and friends began banging on a piano bench. They recorded the sound with a tape recorder, employing reverb and matching the rhythm created by the machine. Simon later wrote the song's guitar line and lyrics on the subject of an untrustworthy lover. The song's title refers to St. Cecilia, patron saint of music in the Catholic tradition.